Scientists confirm existence of largest single volcano on Earth – Massive underwater volcano rivals biggest in solar system | Watts Up With That? The summer blockbuster movie Pacific Rim told a fanciful tale of giant monsters rising from the deep in the middle of the Pacific Ocean. Now, scientists have confirmed that the northwest Pacific is home to a real-life giant of a different type: the largest single volcano yet documented on Earth. Covering an area roughly equivalent to the British Isles or the State of New Mexico, Tamu Massif is nearly as big as the giant volcanoes of Mars, placing it among the largest in the solar system. “This is an amazing discovery, and overturns previous conclusions that Earth cannot support the development of such giant volcanoes because it lacks a thick and rigid planetary lithosphere,” says Jamie Allan, program director in the National Science Foundation’s Division of Ocean Sciences, which funded the research. Located about 1,000 miles east of Japan, Tamu Massif is the largest feature of Shatsky Rise, an underwater mountain range formed 145-130 million years ago by the eruption of several underwater volcanoes. Until now, it was unclear whether Tamu Massif was a single volcano, or a composite of many eruption points. By integrating several sources of evidence, including core samples and data collected on board the JOIDES Resolution, scientists have confirmed that the mass of basalt that constitutes Tamu Massif did indeed erupt from a single source near the center. The results appear today in a paper in the journal Nature Geoscience. “Tamu Massif is the biggest single shield volcano ever discovered on Earth,” says lead paper author Will Sager of the University of Houston. Tamu Massif stands out among underwater volcanoes not just for its size, but also its shape. It is low and broad, meaning that the erupted lava flows must have traveled long distances compared to most other volcanoes on Earth. 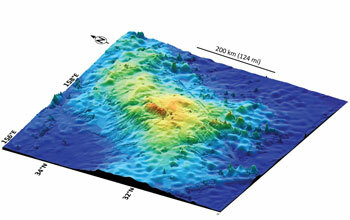 The seafloor is dotted with thousands of underwater volcanoes, or seamounts, most of which are small and steep compared to the low, broad expanse of Tamu Massif. “It’s not high, but very wide, so the flank slopes are very gradual,” Sager explains. “In fact, if you were standing on its flank, you would have trouble telling which way is downhill. Tamu Massif covers an area of about 120,000 square miles. By comparison, Hawaii’s Mauna Loa–the largest active volcano on Earth–is a mere 2,000 square miles, or less than 2 percent the size of Tamu Massif. To find a worthy comparison, one must look skyward to the planet Mars, home to Olympus Mons. That giant volcano, which is visible on a clear night with a good backyard telescope, is only about 25 percent larger by volume than Tamu Massif. The study relies on two distinct yet complementary sources of evidence: core samples collected on Integrated Ocean Drilling Program Expedition 324, which tested plume and plate models of ocean plateau formation at Shatsky Rise in the northwest Pacific Ocean in 2009, and seismic reflection data gathered on two separate expeditions of the research vessel Marcus G. Langseth in 2010 and 2012. The core samples, drilled from several locations on Tamu Massif, showed that thick lava flows up to 75 feet thick characterize this volcano. Seismic data from the Langseth cruises revealed the structure of the volcano, confirming that the lava flows emanated from its summit and flowed hundreds of miles downhill into the adjacent basins. “This finding gives us new insights about oceanic volcanism, the way in which oceanic plateaus form, and the operation of the mantle-crust system,” Sager explains. “Volcanologists debate about the eruptive centers of what are called large igneous provinces. I think most would tell you that they probably come from multiple, distributed fissure eruptions. Second biggest in the solar system? How about those of Io? One wonders how submarine lava can flow hundreds of miles given the high heat capacity of water. One would think lava would cool and solidify pretty quickly, with heat carried away as water boiled to the surface. Anyone have a mechanism? Pat -lava can eg flow under solidified lava. Upon contact with the water, I imagine the topmost lava formed a crust, and a lot of the lava flowing outwards only lifted the crust. More like an intrusion than an eruption. However it must have made for hotter water, and an interesting Pacific, 130 million to 145 million years ago. I would like to see some information about the age of Tamu Massif. The seamount chain northwest of Hawaii dates back over 60 million years at its northwesterly end. 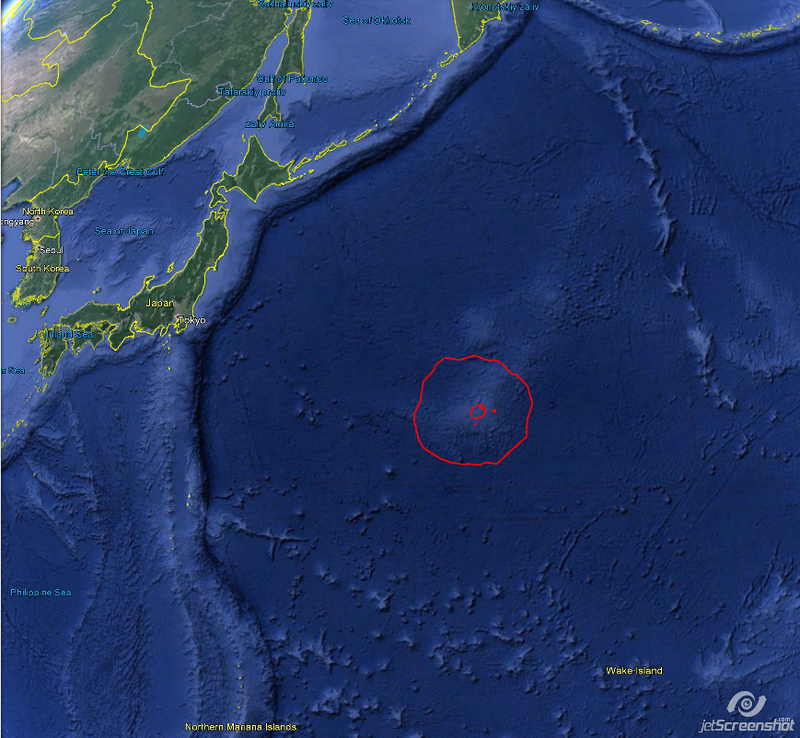 If that chain formed as the pacific plate moved it would suggest that Tamu Massif would be very young. On the other hand, it it proves to be very old, that would suggest that he emporer chain was formed by a moving hot spot. I would imagine there are several ways of dating the various flows — none of which are easy. Magnetic reversal stripes of a core can be correlated a bit like tree rings. To do that would require dozens of cores — not cheap. I’d love to see what kind of dating we can get from this very long lived volcano. Basalt is the most fluid of the lavas and that’s likely what this is since it is oceanic crust-based. But if this eruption took place under sea water, it just would not be be able to flow so far and fan out at low slopes from a single center. A huge rupture of the oceanic crust as a result of a sizable asteroid hit might do it, but I would expect some visible signs of it (chaotic flows, incorporated crustal segments, radial structures…). Drill holes are good but, having laid out drilling programs for mine exploration and development – a hundred holes or so at as close as 50m spacing- I can assure you that a few holes simply won’t answer that kind of question on a target that big. How many holes are there? what is their spacing? One basalt flow pretty much looks like another and you aren’t going to correlate between drill holes spaced in 10s of km or even 1/2 a km without enormous uncertainty. No, this is a limelight paper. So, how does this volcano compare to the Yellowstone super volcano, an eruption of which is claimed to be an extinction level event? There must be some old plate boundaries down there. Well, just enough to know disaster is coming. But not enough to stop asking for grants for further research. It’s in very fine balance. That means at one time there was a very hot spot with a 200 mile radius. I wonder if the ocean was boiling. The heat IS hiding in the ocean!!! ” One wonders how submarine lava can flow hundreds of miles given the high heat capacity of water. One would think lava would cool and solidify pretty quickly, with heat carried away as water boiled to the surface. Anyone have a mechanism? An exceptional lava tube 65km long is said to occur in Hawaii, but most are less than 10km. These start off as surface runnels or troughs subaerially on top of pre-existing lava flows and the surface hardens first as a thin “shell” cover thickening gradually. In seawater, they “pillow” up like taffy balls on contact and it is difficult to imagine them developing a long channel on the surface under sea water. The tubes are not “excavated” beneath existing flows. Moreover, we are talking about a few hundred km in all directions. Believe me, the weak link in this story is correlation of flow units imagined to be hundreds km across with a few holes. It is fanciful idea. This is fascinating discovery. It’s also amazing that we went so long without understanding it. Yeah, the disaster would be the cessation of funding. Apples to oranges, caldera to shield, fruits and volcanoes. The Wikipedia is a good place to BEGIN to learn. Is this an extinct, dormant, or active volcano? Always hotter, sea level is always higher (volcanoes=gravity=higher water)…. It was active 145-130 million years ago The rocky mountains were uplifted 100 million to 65 million years ago. …the surface continually reshaped itself over hundreds of millions of years, continents formed and broke apart. They migrated across the surface, occasionally combining to form a supercontinent. Roughly 750 million years ago, the earliest-known supercontinent Rodinia, began to break apart. The continents later recombined to form Pannotia, 600 to 540 million years ago, then finally Pangaea, which broke apart 180 million years ago. For most of this period, the climate worldwide was warm and tropical, and shallow seas covered low-lying landmasses. At the beginning of the Mesozoic, all of the world’s continents were joined into the supercontinent of Pangea, which rifted into Laurasia in the north and Gondwanaland in the south. By the end of the era most of continents had separated into their present form. I rather doubt that the area was under water at the time of formation or if it was it was shallow water. It looks more to me like it a large igneous province/small chunk of continent that got left behind on the Pacific plate long ago and has slowly sunk into the mantle along with the Pacific plate. There are several of these small igneous provinces/sunken continents/cratons in the oceans with the Kerguelen Plateau being the most famous which is also much larger than this massif. Over time, these plateaus sink along with the ocean crust and get submerged. The other important ones are those in the Drake Passage between Antarctica and South America which long ago, were above sea level and closer to directly in line with Antarctica and South America which disrupted the Antarctic Circumpolar Current between 27 Mya and 14 Mya. The final blow to this impossible scenario: looking along the volcano where it elongates and narrows northward, how does the lava balance on that 100km apophesis after extrusion from the centre without diverting downslope on either side. No, this is a long fracture with several volcanic centres. Its obvious when you look at it this way. You tend not to notice it because you are accepting at the outset. I’m afraid Steve McIntyre’s assessment of the mainstream climate scientists of the team that in another era they would have been high school science teachers, might just be true of a much broader swath across science these days. A white lab coat and horn-rimmed glasses is just not enough. It should be renamed Trenberth Mons. There’s a pretty good post on this over at Eruptions. Suffice it to say, the vulcanologist writing over there is more than a little skeptical of labeling it as a single volcano with everything coming out of a single vent. He suggests it is more similar to a flood basalt (like the Columbia Basin 17 MY ago). As usual, until a substantial amount of data gathering, drilling, and analysis, it is mostly arm waving – great, interesting arm waving. This story appears to be just starting. Should be a lot of fun to follow. Final note is that there a lot of Large Igneous Provinces in the Pacific, several of them far larger than this one and more recently active. I would tend to disagree that this was above water or near the surface at the time of formation, as the base of it is around 6 km and there are no obvious cracks in the crust surrounding it. The entire beast is on the order of the size of the state of California, with the top about 2 km from the surface. That is a LOT of cubic km of volcano to sink under the waves. Everything it displaces has to go somewhere and you should be able to see that via surface faults / other geologic features. I haven’t found any yet. May not be looking in the right places yet. It’s “inactive/dormant” as far as I can find. For what it is worth. Info on ‘nearby’ mainland Asia. It has a map showing Holocene volcanoes in the area. What I was trying to get across in my first comment is you can not take the present location as meaningful given the age. The Geologists can give us a better idea of whether or not this area was above or under water when active. However I seriously doubt it was as far underwater as it is now. I know just enough Geology to realize the earth did not look as it does now but I am no sure what it actually looked like 145-130 million years ago. Heck it could be just the base rock left of a much larger formation although it is a bit young for that. Guess again. Go to Google Earth. Measure baselines below sealevel where the slope meets the abyssal plain. I can easily get a triangle of 134 miles on a NW baseline and a 124 mile cross line to the Maui Channel. Conservatively, that is greater than 8,000 square miles. I can get a convex parimeter of 450 miles, Roughly square. Divide by 4 and square. Greater than 10000 square miles. The caveat is that I’m including all volanos on the Big Island as one volcanic massif. But I think that’s a fair comparison. The massif that the Cook Islands and Suvarov peek above water looks larger than Tamu. 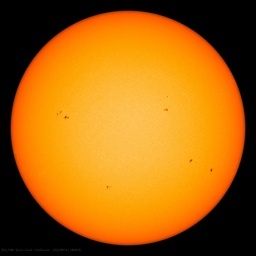 It could be 450×450 mi or 200,000 sq miles. And 17000 feet from base to peak. It might be a plate fragment, but with volcanic parts. Anyone want to bet on how long it takes for someone to claim that the Tamu Massif is caused by man-made global warming? 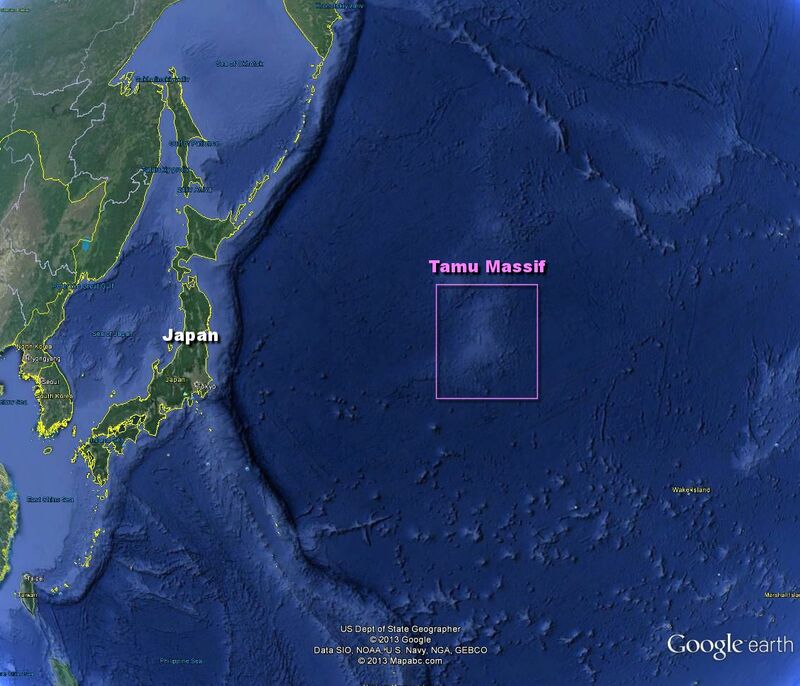 Tamu Massif is 120,000 square miles, the size of New Mexico. The Yellowstone Caldera is 1500 square miles, the size of Rhode Island. Pat, try Undara lava tubes, Queensland. System covers some 55 sq km, with tubes longer than 100 km. Seems like this eruption was on fairly level ground also. Maybe, at the time of eruption the massif was subaerial and only later subsided to become part of the pacific ocean floor. Does one wish to live in interesting times (geologically)? I think not. the Gulf Stream and its extension in the North Atlantic, Kuroshio-Oyashio currents system in the North Pacific and the equatorial currents in the Central Pacific. You can’t compare the caldera of Yellowstone to the shield base of this new volcano. I drove across country and passed through Yellowstone. I began noticing what looked like volcanic soils a hundred miles before I got anywhere near the Yellowstone caldera. I suspect the tephera in the badlands may be from Yellowstone. I have often wondered when watching tv specials about “supervolcanoes” (Yellowstone, etc) they say there are 5 or so on the planet. If 75% of the surface of the earth is covered by water, wouldn’t that mean that there must be 15 or so, under the seas? What if the earths natural state is glaciated, and every so often one of these monsters goes off and heats the oceans to the extent that it warms the atmosphere for a while. (I must admit, ten thousand years seems a bit longish) The Holocene appears to have started warmer than we are now and has been getting colder since. Especially if NATIONAL GEOGRAPHIC is involved. I checked carefuly using GE overlay feature the second seabed map image and after measuring the area it very much looks to me the area marked by the blue rectangle (-while still twice to thrice larger than the Tamu Massif really covers there) is about 160 thousand square miles. Even way smaler is the area showed at the first 3D projection image – about 80 thousand square miles. So to me a claim the “single volcano” Tamu Massif covers an area of 120 thousand square miles looks quite exorbitant and more like an overblown marketing of the research than a serious claim with sufficient scientific exactness, not speaking that to use such number for a comparison with the real volcano gigant Olympus Mons on Mars and compare the “25 percent” smaller Tamu Massive area explicitly to New Mexico area is quite weird, because although way higher and massiver than Tamu the Olympus Mons covers an area of not more than 100 thousand square miles (as anybody can check with Google Mars using elevation data there) which is an area smaller than Colorado. A to-scale-picture how Tamu looks overlaid by Olympus Mons (its ~1000 meters elevation above Mars datum shape). To help the comparison even more: in case the Olympus Mons would be there instead of the Tamu Massive, it would stick high out of the ocean all the way up to the stratosphere, still being almost twice as high than Mount Everest. Pat – You’d probably get a bubbly glassy surface layer – like pumice – which would be a great insulator, the lava would stay liquid and flow freely underneath. It would be very similar to an “aa” flow on the surface, just with a different type of crust. Now will warmistas stop saying that Prof Ian Plimer is wrong when he says at least 80% of volcanoes are under the sea and generate vast quantities of CO2 dwarfing any human emissions. PLIMER IS RIGHT!! (Monbiot call your office). Gary. Google komatiite rock and also check out some of the world’s komatiite nickel deposits including Raglan in Quebec, Canada. The Raglan horizon is over 100 km long and several hundred meters deep. It is basically a sill that was once flat and is now situated sub-vertical (due to tectonic movement). I’m not a geologist but I recall these things form as pools of molten sulphide on the surface of the ocean-bottom with the top-most layer quenching to glass and insulting the under-lying magma which is quite liquid and will flow great distances under pressure. In some places the flowing magma gouges out rivers and heavy elements (such as nickel-copper sulphide) sink to the bottom forming future mines. There is a progression of disseminated to net-textured to massive sulphide (from top to bottom) which is an easy marker for determining which way was up. Assuming Plimer is right that “at least 80% of volcanoes are under the sea” then they could be responsible for the recent rise in atmospheric CO2 but NOT because they emit CO2. Almost all the CO2 circulating in the carbon cycle is already in the deep ocean. The pH of the ocean surface layer varies so much in space and in time that there is no possibility of detecting an average pH change of 0.1 in ocean surface layer (because the change is so small). It is very, very unlikely that CO2 could induce a pH change of 0.1 in the ocean surface layer because of the carbonate buffer. But an injection of additional sulphur ions into the ocean surface layer could do it. A change of only 0.1 in the average pH of the ocean surface layer would alter the equilibrium between atmospheric CO2 and oceanic CO2 concentrations to induce a rise in atmospheric CO2 which would be greater than the claimed rise from 280 ppmv to ~400 ppmv since the industrial revolution. Such a pH change could be (but probably is not) a result in variation of sulphur emission from volcanoes beneath the sea followed by the sulphur taking centuries before the thermohaline circulation conveys it to the ocean surface layer. Volcanism is not constant. Variation in sulphur release from undersea volcanism could be responsible for ALL the recent rise in atmospheric CO2. And it could be responsible for the large peak in atmospheric CO2 around 1940 indicated by Beck’s data. This possibility has serious implications whether or not it is the cause of the observed rise in atmospheric CO2. The fact of this possibility invalidates all the ‘mass balance’ arguments for an anthropogenic cause of the rise in atmospheric CO2. @Gary. Molten magma (containing sulphide), not molten sulphide. So only in XXI century we discover something like this? Looks rather similar, from 110 Mya, rose and sank 3 X, most recently 20 Mya. Thx. Geochemistry, another specialty the Jackasses of All Sciences, Masters of None have slipped up on. Quelle surprise!